For those of you that follow my instagram or are friends with me on facebook you’ve probably noticed I like to take pictures of the New York City skyline, particularly from the Hoboken piers. Initially I told myself I wasn’t going to start with a skyline shot but in the end it made the most sense for at least one BIG reason. Taking skyline pictures is pretty much what got me into photography in the first place. The more skyline pictures I took the more I realized how much I enjoyed taking pictures and that I really needed a better camera. The second reason this picture is significant is because it’s by far my favorite spot in Hoboken. I’ve dubbed this “my bench” and usually spend at least one morning/evening a week sitting here soaking in the view. Whether I’m drinking my morning coffee or taking a breather after a run on the pier, I often find myself back at this bench. 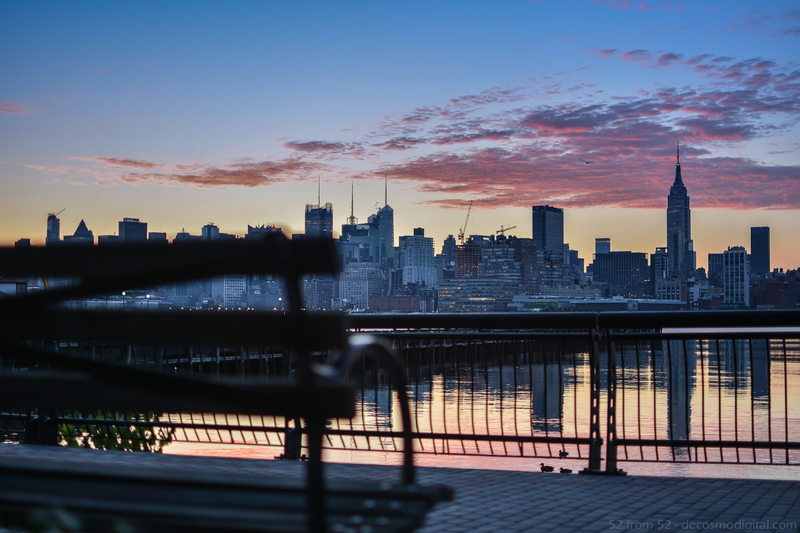 My favorite time to sit here is the early morning for a couple reasons; there are a lot less people walking around, you hear tons of birds chirping and waves crashing during high tide, and you obviously get a great view of the sunrise. It’s very tranquil and a great way to start out your day. Trying to capture the feeling of sitting in this bench is why I decided to start out with this picture. First I shot this picture at f/1.8 which is the widest aperture (opening of the lens) and shallowest depth of field I can take. It might seem odd but the smaller the ‘f’ number the larger the opening of the lens is. While the larger the ‘f’ number the smaller the opening is and the more things are in focus. I took this picture with a small ‘f’ (fstop/aperture) of 1.8 initially to put the bench in focus and blur out the skyline but after trying one in reverse with my focus point on the buildings, I liked this one better. Shallow depth of fields give that blur effect and are hard if not impossible to pull off with a camera phone since you can’t control your camera’s lens opening like with a DSLR. For my fellow instagramers, the blur feature on instagram is meant to mimic depth of field shots but it’s limited to the circle or straight area. I felt like by using the shallow DOF in this picture it makes it easier to imagine yourself sitting on the bench. The second concept in play is the rule of thirds. In this picture the bench is in the far left/bottom third of the picture with the rest of the scene in the middle/right thirds. For anyone that doesn’t know about the rule of thirds, it’s just breaking the picture into thirds vertically and horizontally (seen below). This results in 9 boxes with 4 intersection points. It’s said that by putting subjects or things such as eyes on these lines makes for more dramatic pictures. In my picture the bench is on one of the intersection points and clouds are on two. Using the rule of thirds in this way helps you focus on the sky and give you the feeling of looking out from the bench from left to right. The last sort of “concept” that I want to point out is the timing of the shot. When shooting sunrises or sunsets it’s said that the best light is +/- 30 minutes of the actual sunrise or sunset time. On the morning of this picture the sunrise was at 5:58 AM. I got to my spot a little later than I had hoped (hit the snooze a couple times) but I still managed to get the light I was looking for. Once it got close to and then past the actual sunrise time the colors seemed more washed out. Overall I’ve learned that my favorite time to take pictures of the sunrise is before the time and for sunsets is after.